The "ELF" is Rob Cotter's dream come true. "I've always wanted to create a small, efficient vehicle that incorporates solar power," said Cotter, an auto technician and design expert. 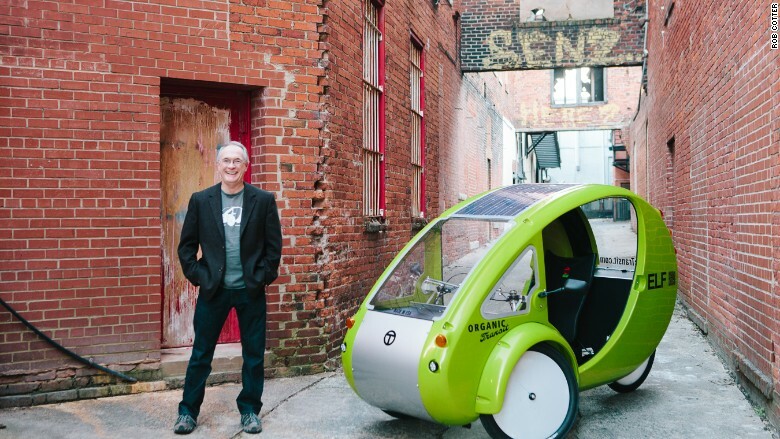 He's done that, and a lot more, with his 160-pound hybrid electric-pedal, three-wheeled bike called ELF. "The ELF can help reduce the carbon footprint in cities," he said. "It's environmentally-friendly, safer than an ordinary bike and you can carry cargo in it." Cotter's startup Organic Transit launched the ELF in 2012. The bike, priced between $5,500 and $10,000, is made in Durham, N.C., and features an egg-shaped shell that shields the rider from bad weather. It can top 20 mph using just electric power (the battery charger plugs in to any wall outlet) and 30 mph with pedaling. Organic Transit has sold over 450 ELFs, mostly to "individuals who are using it as a commuting vehicle and for exercise," Cotter said. "One person said he even rode it from Ontario to Key West." His next goal is to grow the market beyond just personal use. "We've had interest from businesses, universities and city agencies such as police departments," he said. The startup is working on a more heavy-duty successor to ELF, which could potentially carry up to three passengers. "My intent is that with every person that uses our vehicle, it'll help improve their health and drive down their transportation expenses," said Cotter.